The records are referenced by Census Piece, Folio, Page and Schedule. The registration district is a unit of organization for collecting the census information. Information is collected in geographical areas that are manageable sizes for a team of enumerators to record. They are often a section of a county, but may often cross county borders. The number following the year code is referred to as the Piece Number which is a collection of enumerators books for the whole district. Each census book sheet is referred to as a folio. This usually contains a group of records for a street or a village / hamlet in the district. In some cases it may be part of a street. This is in effect two pages of the enumerators book. The folio number usually appears as a printed add on at the start of each pair of pages. This is exactly what it says - a single page in an enumerators book. The schedule is a measure of a single household. This is usually held on a single page, but in some instances a schedule may go over two or more pages. 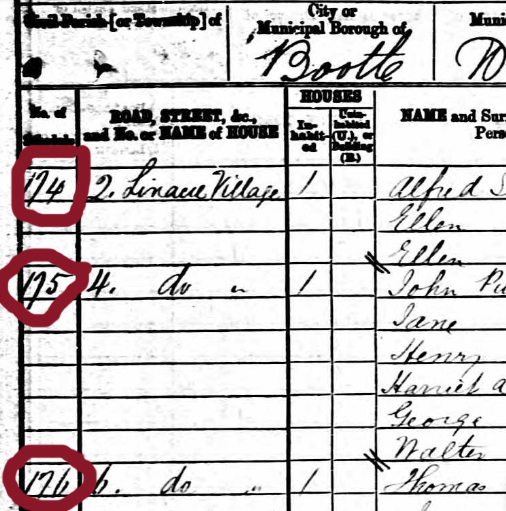 The schedule numbers in early census years are listed at the side of each household unit. In censuses from 1901, most schedules are on a single page of a book. Schedules are only carried over for very large households and institutions. In modern Census collections, which have not yet been released, the schedule is a whole book which may have an extension book for institutions. Note of caution - the information recorded in the census records is essentially what people told the enumerators. Accurate information and mis-information go side by side. Census records are a very good guide, but inaccuracies can arise from how an enumerator phrases a question to how a householder is prepared to answer that question. If people were unable to write or read, then the enumerator would have to transcribe there spoken work as best they could. Records start with the head of the household. This title will only be omitted if the head is absent from the home on the day of enumeration. All other entries will be recorded in respect of their relationship to the head of the household or institution. In the early censuses - 1841 / 1851 / 1861 - the age of individuals of 20 years and above were recorded to the nearest 10 years or the nearest 5 years. In some cases, people may not want their age to be clearly known, or may not have been sure of their exact age. 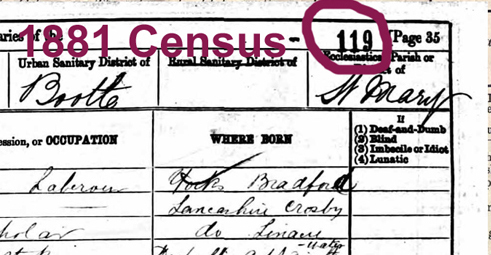 The census records where an individual was born. Place names may have changed over the years and people my give the exact location or a more understandable and more easily identified nearby major town or city. Other sources like Births, marriages or deaths, electoral rolls, etc. should be used to confirm Census information wherever possible.